As a pet owner you understand the importance as well as the fun of your dog getting plenty of exercise. You might not be able to throw a ball for your pet and are looking for a toy helping your dog enjoy fetch. You may be looking for a toy your dog can play with while your inside or at work for the day. You may be just looking for a fun toy to help you throw your dogs ball farther! In all of these cases you should try an automatic dog ball launcher! These toys also go by the names of dog ball thrower, automatic ball thrower, automatic dog ball thrower, automatic ball launcher for dogs, automatic ball launcher, dog ball launcher, and many other names. The automatic dog ball launchers are battery- or AC-operated machines which shoot balls across the yard or the house (generally 10-30 feet) so that your dog can chase and fetch them. Your dog can be trained to return the balls to the funnel-shaped opening in the dog ball thrower and enjoy hours of entertainment fetching balls without any involvement from you whatsoever! There are also manual throwers that help you throw a ball farther giving your dog more exercise. Read below to find the fetch toy that best for you! Whether you’re an experienced pet owner, or you’re a newbie researching the latest dog toys, we’ve got a ton of information here for you to help decide which type and brand of dog ball launcher might be best for you and your best friend. The iFetch shoots smaller balls (1.5 inches in diameter), so it works best with small- to medium-sized dogs, while the iFetch Too, PetSafe, and Go Dog Go shoot tennis ball-sized balls and would make a better choice for large dogs. The iFetch Too is basically an iFetch for big dogs since it operates in the same fashion as the original smaller model. You also want to consider how much space you have available. The iFetch has three different settings allowing you to launch the balls distances of 10, 20, or 30 feet. 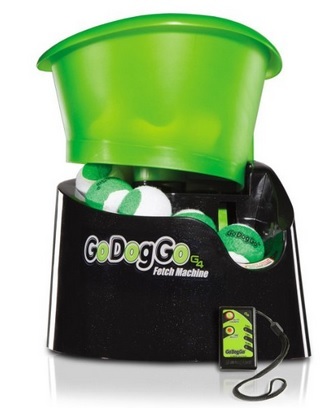 The GoDogGo G4 fetch machine shoots balls farther, but for that reason it is not as ideal for indoor use as the iFetch. There are many different types of dog ball launchers on the market. Some take normal sized balls and some do not. You should take this into consideration when selecting the product for you. buying regular tennis balls from the store verses special balls from a manufacturer can make life easier when the inevitable happens and your dog has worked it’s way through all of the balls. The original iFetch is generally more affordable than the Go Dog Go however the Go Dog Go is more affordable then the iFetch Too. Either way, it’s a significant investment, but in our experience, the price is worth it, because you’re getting an automatic ball thrower for dogs that you can use for years to come. There are cheaper Dog Ball Launchers but as we talk about below some of them may not be worth the savings. Are You Looking For Indestructible Toys? What Size Dog is this Dog Ball Thrower Good For? For medium to large-sized dog breeds, there’s the iFetch Too, a bigger, more powerful machine than the original iFetch. The iFetch Too uses balls that are the size of regulation tennis balls, which is convenient because you can easily replace them when the original balls wear out. How Far Does The iFetch Too Launch Balls? There are three distance settings on the iFetch Too. The shortest setting is appropriate for a small backyard or indoor use, while the two longer settings make more sense when you have more space available for fetching. While we couldn’t quite get the balls to launch 40 feet in the park, that may be because the ground and the balls were slightly damp after a rain the previous day. We achieved ball launch distances of roughly 30 feet in these conditions. What Size and Type of Balls Work with the iFetch Too? The iFetch Too comes with three blue balls that are the same size as regular tennis balls, but a little more heavy and dense. We also tested the device with Regular Sized tennis ballsfrom a sporting goods store. Both worked just fine, and I didn’t notice a difference in terms of launching distance with either type of ball. How Loud is the iFetch Too? One thing that’s interesting is that the iFetch Too actually makes less noise than the smaller iFetch. The motor for the iFetch Too only kicks in when you’re using the most long-distance setting. For the two intermediate distance settings, the machine makes very little noise, which is a nice surprise. Is the iFetch Too Rechargeable or Does it Require Batteries? The iFetch Too doesn’t require store batteries of any sort; instead, you charge the internal battery by plugging it into a wall outlet, and then you’ll have a fully charged machine ready to take out to the park. The iFetch Too was tested with large breeds like Border Collies, Golden Retrievers, and Italian Mastiffs, and they all loved it. In our own field tests, we observed that both a Viszla Beagle and even a smaller Jackrat Terrier both learned how to use the machine very quickly and couldn’t get enough. There are many different breeds of dogs out there bursting with energy. Sometimes as an owner you wish your dog could entertain themselves in a constructive and healthy way. Maybe your not able to play with your dog for physical reasons. Or maybe your dog like playing with themselves.. err with balls. Well you understand. The iFetch Too is just what you need! It’s one of the best dog ball launchers on the market today. It lets your dog play fetch over and over again until it’s heart is content! My Jack Russel Terrier loves the original iFetch, but for the larger iFetch Too model, I wanted to test it out with a bigger dog who likes fetching standard-sized tennis balls. Enter Carl, a 50-pound vizsla beagle mix who loves playing fetch in the park. We tested the iFetch by letting Carl Play with it in the park! As soon as we popped the balls in the machine, Carl had a blast chasing them down. He quickly learned to drop the balls in the slot himself, so that he could play fetch on his own without any assistance from us. Most dogs may not learn how to do that so quickly, but that should be your ultimate goal as an iFetch Too owner. Once you teach your puppy how to retrieve and launch on his own, you can sit back and relax! Carl is full of energy, so he continued to chase down balls for close to half an hour without tiring. 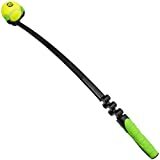 Overall, we were very pleased with the performance of the iFetch Too and can definitely recommend it as a great tennis ball launcher for medium and big dogs. Larger pets need lots of exercise, so a device like this that shoots long distances is ideal. The iFetch Too is not cheap, but it’s durable and well-made and will pay for itself after many rounds of fetch. In 2015, the iFetch Too hit the market, offering owners of medium- to large-sized dogs an opportunity to join in the fun as well. While the standard iFetch uses smaller balls, the iFetch Too is an actual tennis ball launcher. That makes it perfect for bigger dogs! 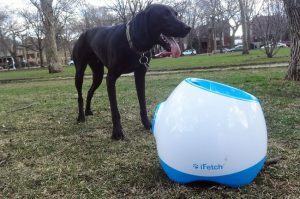 The iFetch had established itself with the original dog ball thrower created in 2014. Though the iFetch is popular as well, the GoDogGo has a few advantages over it. With a bright green ball bucket and sharp black body, the GDG is more eye-catching than the white iFetch. It’s also versatile enough to shoot different kinds of balls, from smaller mini balls to regulation tennis balls. The launcher is very powerful and can shoot balls several feet into the air and also works well outdoors. This Machine is better for larger dogs. How Far Does This Launch Tennis Balls? Up to 35 feet depending on the Ball and as short as 7 feet. There are 3 settings to adjust the shooting distance. What Size Tennis Balls Can I Use in the GoDogGo? Any ball between 1.87 and 2.5 inches. At most retailers, the GoDogGo is more expensive than the normal iFetch but less then the “ifetch Too”, but it does boast a nice color and appearance. Dog owners love this one, so do your research to make an informed decision. Click here for More Details! 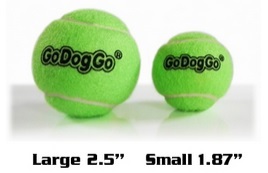 One big advantage of the GoDoGo is that it fits various sizes and types of balls, including standard tennis balls. Other dog fetch toys require smaller balls, the GoDogGo you can easily get the balls you need for launching. You can use any ball between 1.75 and 2.5 inches, which also includes ChuckIt balls or tennis balls. There are several distributors offering the product in other countries such as the UK. For a list of sellers see the manufacturers website. The product is only available through the manufacturers website. The noise the launcher makes sometimes scares dogs. There are some online reviews which talk about this. If your dog is susceptible to loud noises then you may want to consider another ball launcher. The bright side is if your dog has issues with it, you can return it within 30 days. Do your research – if you need a ball machine for big dogs, this one may still be the best purchase for you. The Go Dog Go Dog Ball Fetcher is a good ball catcher for larger outdoor dogs. This ball fetcher length is adjustable but tends to launch the ball higher then most ceilings. This ball fetcher has safety features as well as a friendly remote interface. 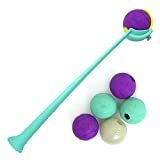 It is the most popular and was the first dog ball launcher produced! This product has a large following and is the easiest of the Dog Ball Launchers to use. 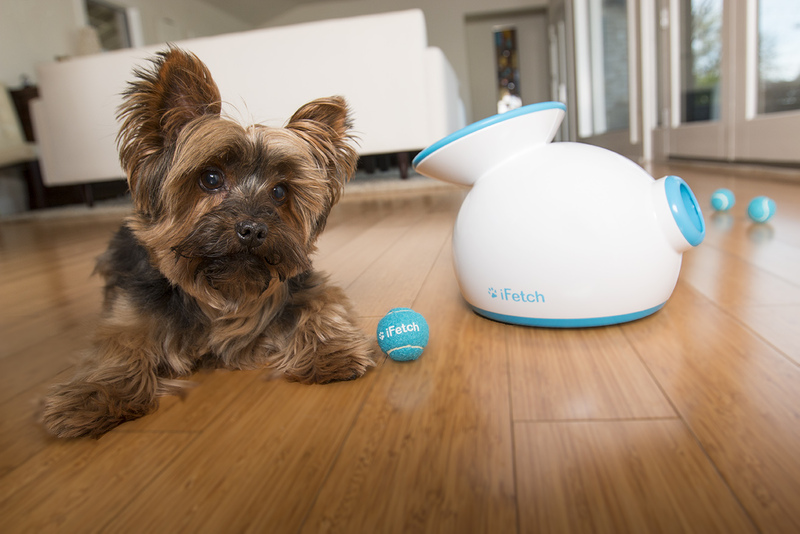 The iFetch uses small, soft blue balls that won’t hurt your dog. They are easy for any small to medium dog to fetch. Best of all, smart dogs can be trained to retrieve the balls and drop them into the funnel, which causes the machine to shoot them out again. It’s a neverending game of fetch that you don’t even have to be involved in! Read our full iFetch review. 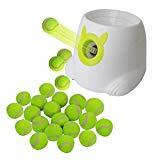 If you’re here, it’s probably because you’ve heard all about the iFetch automatic ball launcher machine and you want to read iFetch reviews from users or find out more about the popular dog ball toy. 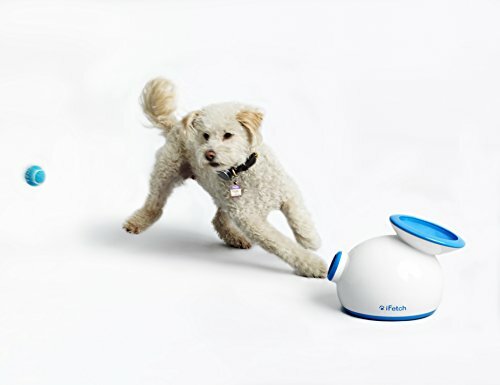 For the unfamiliar, the iFetch is a small motorized device that shoots mini tennis balls across the room that your dog can fetch. It’s called an “automatic ball launcher” because all you have to do is drop a ball into the funnel-shaped hole on the top, and it shoots the ball out the other side. Looking for details about the iFetch price, size, user reviews, and owner testimonials? Read on for the inside scoop. So what’s the iFetch price? 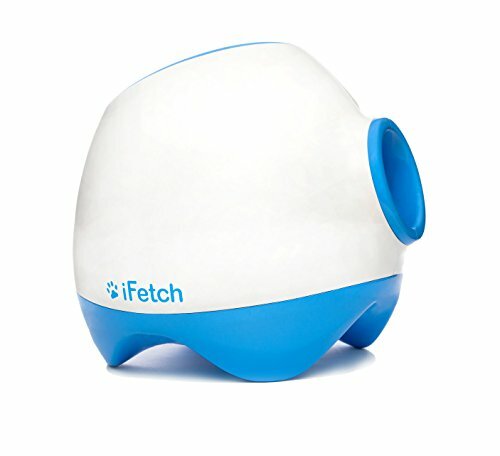 You can see how much the iFetch is currently selling for by clicking here to view to item on Amazon.com. The iFetch is sold at A handful of retailers and pet stores across the country, but this is mostly a product that is purchased online. The iFetch dimensions are roughly 14 x 11 x 9 inches, and the balls are about 1.5 inches (40 mm) in diameter. That’s smaller than a typical tennis ball, and smaller than the balls for some other automatic ball launchers, like the Go Dog Go. The iFetch works best for medium and small dogs. 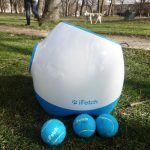 If your looking for a automatic dog ball thrower from itfetch for larger dogs, see the iFetch Too. 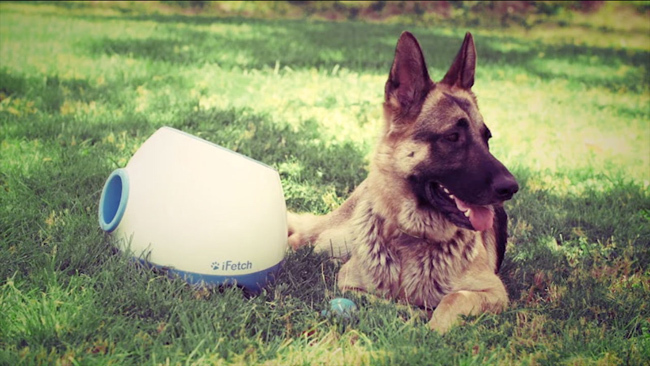 The iFetch runs on AC adapter power, or from six C batteries, which can provide about 300 throws of use. The adapter works for 110 or 220 volts. Batteries are not included. The iFetch review can be summed up easily: It’s a great product! 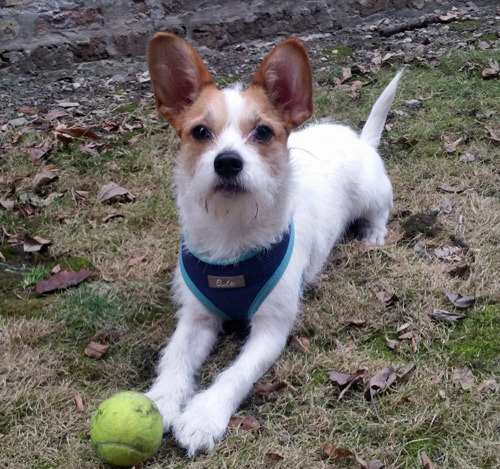 A Jack Russell / Rat Terrier mix named Benji – tried out the iFetch and loved it. Initially, I wasn’t able to teach him to drop the balls into the machine on his own, so I had to do it for him. Eventually, he learned to drop the balls himself and was able to play fetch on his own. We used the machine both indoors and outdoors. The iFetch is more fun in the backyard, in the grass under sunny skies. But in the colder winter months, it’s great to be able to use the fetch toy in the dining room. One drawback was the balls tend to wear out fairly quickly. You will be stuck either trying to find some alternatives or purchasing more balls from ifetch. You can save your self some hassle by purchasing KONG XSMALL Sqeeky balls that come 3 in a pack when you purchase your ifetch so you never run out of fun! 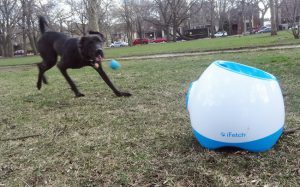 The ifetch is a great dog ball launcher for inside and outside. 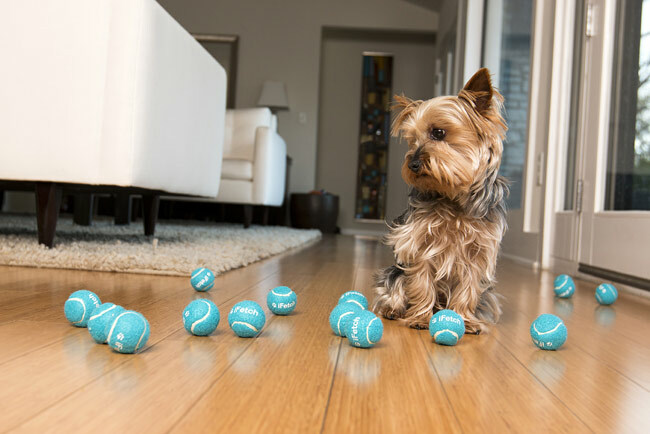 This uses only smaller balls which can be purchased from ifetch. Also this can be plugged in or takes batteries. This is better for smaller dogs and was the first dog ball launcher made by ifetch. The ifetch Too may be a better launcher if you have larger dogs. The Hamill family created iFetch some years ago at the Hamill family’s kitchen table. Grants dog kept interrupting him by bringing over balls for him to throw. Grant then wondered if it would be possible to create a machine that would automatically shoot balls for the pet. Grant’s grandfather Denny thought it was a great idea. Months later, they tested prototypes and set up a Kickstarter to make the whole thing happen. Now, in 2015, the iFetch is an immensely popular dog ball toy (with hundreds of positive iFetch reviews from satisfied users) that allows pets to entertain themselves as they chase and retrieve balls from the machine. 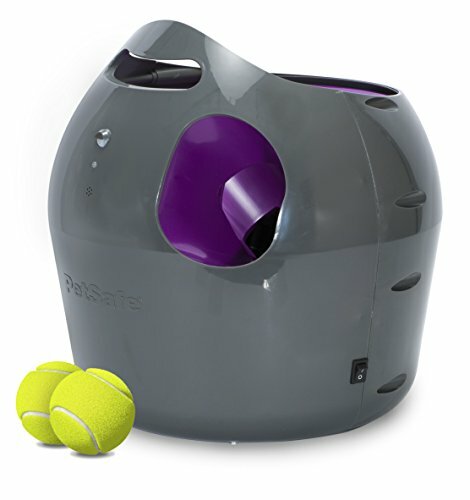 With its modern, almost regal gray and purple design, the PetSafe ball launcher stands out visually. But we know that appearance is way down on the list of important factors for a ball shooter. This launcher does have several other safety features that you might enjoy. More importantly: How does it function? 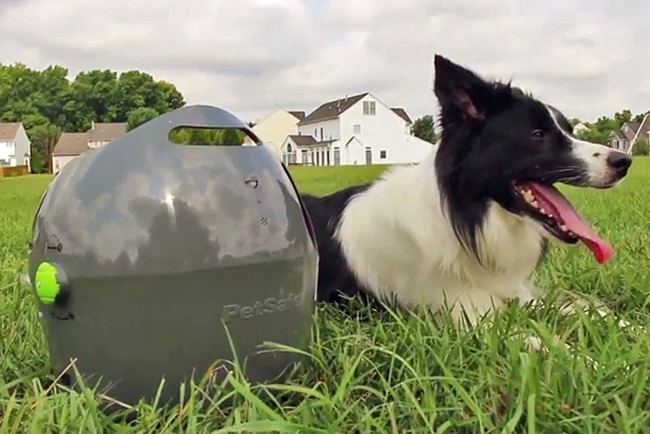 How Far Does the PetSafe Dog Ball Launcher Shoot Balls? 9 Distance Settings up to 30 ft. The PetSafe even includes different angle settings so you can shoot balls in various directions. This is a fantastic feature that most ball launchers do not have. Usually, if you want to find a ball shooter with angle settings, you have to buy a giant, expensive tennis ball machine! 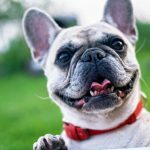 What Size Balls Does the Petsafe use? On the con side, some users are reporting that the PetSafe isn’t as durable as they’d hoped. So while the PetSafe may cost less than the iFetch Too, whether it will last as long is questionable. We like what we’re seeing from the product’s specifications. The PetSafe includes a whopping nine distance settings, more than most other shooters. Just turn the distance knob on the side of the machine to adjust how far you want the balls to travel. The PetSafe uses standard tennis balls. The Petsafe Dog Ball Thrower also has several other safety features that other competitors do not. This is not our first choice due to issues experienced with durability issues. This dog ball launcher does actually have a safety feature so your dog does not get pelted in the face with the tennis balls which is a nice feature but can inhibit play if the dog does not stay far enough away from it. Another compliant is the 15 minute timeout period does not always make sense for the dog. We suggest for the money looking at some of the other Automatic Dog Ball Launchers. Features a 15 minute rest and play period. Dogs can play for longer and timer inhibits playtime. How Far Does the Paws and Pals Dog Ball Launcher Shoot Balls? Like other tennis ball launchers this has adjustable distances which can be set on the unit itself. What Size Balls Does the Paws and Pals Use? 2 inch size balls and cannot use normal sized tennis balls. It does not have a remote with it but does have features the other dog ball launchers do not have. Another advantage is it’s also rechargeable and does not require batteries. This is a decent dog ball launcher for the money and it does offer a unique feature of dispensing treats. The buttons are on the front of the launcher and sometimes the dogs can accidentally push them. Another thing to be aware of is that the angle is shallow so the ball stays low to the ground. Overall this is not a bad product and is less expensive than the competition. For small or mid sized dogs this is a good option! The iDogmate mini is a dog ball launcher introduced into the market which is both colorful and full of features. This Machine is better for smaller dogs under 11 lbs or 5 kgs. This is specifically manufactured for dogs smaller than 33 lbs or 15 Kgs. The distance is adjustable with the remote. 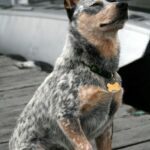 What Size Tennis Balls Can I Use in the iDogmate Mini? You will have to order more online if you need more from the manufacturer. Is the Price Reasonable For What You Get? Aside from being aesthetically pleasing, the iDogmates design is also user friendly. The bright green and white color palette matched with the solid frame and sleek curves make this automatic ball launcher attractive to dogs. A little bit below the unit is a bright green ball chute that helps to funnel the ball into the machine in readiness for launch. The power switch that helps to easily turn this device on and off is located on the back of the device together with the AC adapter port. Right next to the power switch is the on/off button in case you are using rechargeable lithium ion batteries. Although the 2 power buttons are confusing there is a simple way to distinguish them; the bottom switch will turn the power on from a wall outlet while the top switch turns the launcher on and off from the internal lithium batteries. This is one of the coolest and most fun parts of this device! 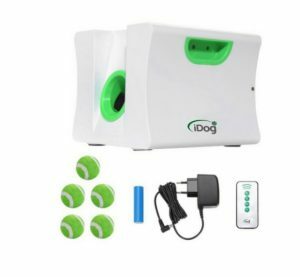 The iDogmate Mini ball launcher comes with a mini remote control that helps adjust distance settings, helps reset the device and also helps turn the power on and off. Once you have trained your dog how to return the ball to the device, controlling this device using the remote is a convenient and easy way to change up the distance so that you can keep your dog’s mind alert and entertained. 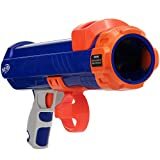 Most of the automatic ball launchers in the current market only use 6 C batteries which as you probably know are quite expensive especially when used frequently. The device uses fully rechargeable lithium ion batteries which according to the manufacturer can shoot a maximum of 1700 balls with just one single full charge! This dog ball launcher was designed for smaller dogs. If your dog is larger than 11 lbs, you may be looking for a Dog Ball Launcher that is capable of throwing balls a fairly long distance with larger balls. Some users are reporting that the iDogmate Mini is inconsistently reliable. The unit we tried out worked well but other users have found issues. The DoggyFun fetch toy launches mini-sized balls rather than regular tennis balls, so it is appropriate for smaller pets. It operates using batteries or a wall plug, and it has three different distance settings. What Size Ball is This Good For? How Far Does it Throw? This launcher throws up to 20 ft.
What Sized Balls Does it Take? The machine doesn’t necessarily come with any bells or whistles. It does take batteries and can also plug into an AC adapter. This is a basic dog ball launcher made for smaller dogs. It has a low angle and cannot launch to far so it’s best suited for smaller dogs. This machine does tend to jam easily and people complain about the balls not being of the highest quality. 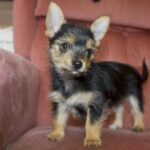 It is a good value however for the money if you have a smaller dog. Fill the Fetch N Treat with dry food or treats and see how much fun your dog will have fetching the ball back to the toy to get his reward! This toy will stimulate your pet to play even when you are not available to him. 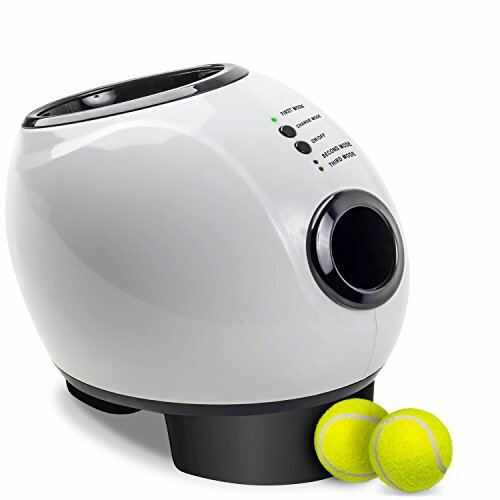 The All for Paws model is a bit different from the other devices in that it shoots not only tennis balls, but also dog treats! 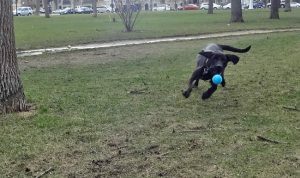 It’s a brilliant idea to make a product that rewards puppies for fetching balls, but its ball-launching distance is suspect, so read through the reviews before making a final decision on this model. It’s an eye-catching white machine with bright accents that appear to be either lime green or neon yellow. No batteries or power are needed. That’s good because it means you won’t have to worry about charging or buying batteries, but it’s bad because that means it doesn’t have enough power to shoot the balls as far as some of these other machines. There are others as well so do some price shopping! We think this product is better suited for small to medium sized dogs. How Far Does This Dog Ball Launcher shoot Balls? What Size and Type of Balls Work with this? There are some complaints however in regard to the quality of balls. They do not typically last very long and having to purchase more balls means more costs to own this product. Is This Dog Ball Launcher Rechargeable or Does it Require Batteries? This tennis ball launcher can be plugged in or can also operate on 6 C size batteries. This product does not work for very long running off batteries however. To conserve batteries this product turns off after a minute but that can be a nuisance if your dog is not interacting with it enough. This product is very inexpensive but unfortunately it has many other costs associated with it like buying more tennis balls. We also found that the quality of this product can vary drastically and the product does not last very long. It can be plagued with the sensor not detecting the ball, as well as reports of balls getting stuch in the mechanism. We suggest trying one of the higher quality models. They are a bit more expensive but will save you time and money overall. A lot of the models listed use standard sized tennis balls and last longer when powered on batteries. The quality is much better in other products as well and will be a better investment for your dog. READY SET FETCH: Automatic tennis ball launcher that will provide your dog with continuous interactive play. Can be used with all brands of tennis balls. SAFETY: Set the motor dial to the desired distance. When the ball is preparing to fire there is a safety mode alerting your pet the ball is about to launch. This sound feature can be turned on and off. OFFICIAL SIZE TENNIS BALL: Comes with 1 standard non-abrasive tennis ball. Launches as far as 10 to 40+ feet. Try to not get them too dirty or wet as this will effect performance. This dog ball launcher is brand new to the market this year. It has many of the standard features the other dog ball launchers do, however it does not have a remote and there is not a whole lot of data out there on the quality of this product yet. We think this product is suited for all sized dogs. Wet slobber balls also effect the operation of this device. This tennis ball launcher can be plugged in or can also operate on 8 D size batteries. This helps this dog ball launcher perform longer when running on batteries. This is a brand new product and although it has a lot of cool features, this product does not yet have a track record associated with it to evaluate quality. One unique feature is the launcher plays a sound before launching a ball to warn the dog. This can be turned on or off. We would recommend one of the more seasoned dog ball launchers. INDOOR & OUTDOOR: Can be used indoors or outdoors. The unique design can even be suitable with your home décor. Product size: W25 x D17 x H26 cm and made of plastic ABS. 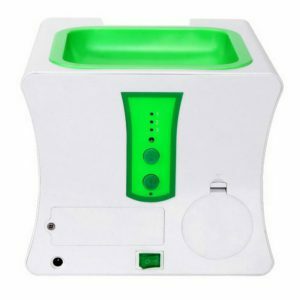 INCLUDES PET TREAT FEEDER: The DotPet Launcher is the only brand that includes a pet treat feeder in addition to the ball thrower. REQUIREMENTS: Operated by batteries or AC adaptor. Requires six 1.5V CR14 batteries (not included). 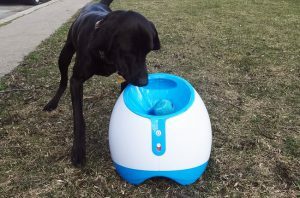 This product is unique in that it also has a pet dispenser which dispenses a treat every time the dog puts the ball back in the launcher. We think this product is better suited for small dogs due to the small ball size. This launcher can operate with an AC connection or with 6 C cell batteries. There is not yet much data on the product. However this product is a low cost launcher for smaller dogs. The treat dispenser is unique however not really needed. The dog is rewarded with the launcher throwing the ball and it’s easy for the dog to catch on. Automatic dog ball throwers are becoming more and more popular these days, as pet owners try to relieve some of their own burden while ensuring that their pooches still get plenty of playtime fun. Based on our personal experience, we highly recommend the iFetch if you’re looking for an electronic ball launcher, and the Hyper Pet and ChuckIt if you’re seeking a simple hand launcher. An automatic ball thrower for dogs only works when your canine buddy knows how to use it. In order to maximize the benefits of a machine like the iFetch or GoDogGo, you’ll need to train your pooch to respond to certain commands and teach them how to drop the balls into the slot. iFetch has conveniently created a video that helps pet owners work through this process. The video uses shaping and positive reinforcement techniques to help doggies learn that good things happen when they fetch balls and return them to the machine. Give this clip a look for more details! ChuckIt makes several different dog fetch toys, from basic hand launchers to the more sophisticated fetch wheel. The ball launchers are simple. Instead of tossing a ball with your hand, you grip the ball with the launcher, then fling it forward. ChuckIt balls can travel up to 140 feet with this technique, which is a lot farther than the other throwers on this list. It’s a guaranteed way to wear out your pup in just minutes. ChuckIt products are affordable, but their biggest strength is that they are durable. ChuckIt has a reputation for producing quality products that stand up to a ton of wear and abuse from excited dogs. The launchers come in several different sizes, from mini versions to the biggest “Pro 26” model. Read out ChuckIt ball launcher review. Hyper Pet K-9 Kannon Ball Launcher is a plastic gun that shoots tennis balls around 30 feet or so. Some users have complained that the range isn’t big enough, but if you wanted to heave balls by hand, you could do that without a machine. The Hyper Pet is for folks that want to avoid tiring out their arms and prefer to simply squeeze a trigger instead. Plus, it’s cool and k Save ind of empowering to walk around with a pretend weapon in your hand. As you might expect from a product that is sort of a compromise hybrid of the other types of ball throwers, the Hyper Pet Kannon Ball Launcher price is between the iFetch and ChuckIt brands, making the Hyper Pet a nice value in our estimation. This dog ball launcher can shoot up to 200 ft (60.96 m). It uses a slingshot style mechanism to launch the balls. This launcher can use standard size tennis balls which is a bonus. This dog ball launcher also boasts you can pick up the balls with the mechanism without touching the ball and your dogs slobber! This one is not an “automatic” ball launcher. You have to do the work yourself, by inserting a ball into the slot, then stomping on the base with your foot. The ball then shoots 15 feet or so. While the Sportime is not specifically designed for dogs, pet owners report that it works just fine as a fetch toy. It’s also priced well below the other launchers, so if you need a budget launcher and you’re willing to do some stomping, this one might make sense for you. Comfortable grip and variable throw settings - great for men, women, plus kids through grandparents! This is an innovative dog toy. It adds the new feature of being able to adjust the distance. The Distance is adjustable and if your able you can throw a Chew King Ball 50 ft! Comfortable grip and variable throw settings – great for men, women, plus kids through grandparents! This product can be fun in the dark! It’s the great Chuckit! ball launcher. All medium 2.5-inch Chuckit! balls, including the Ultra Ball and Tennis Ball. One included with the product. What Size Balls Does it Take? Chuckit also makes throwers specially designed for their Ultra Balls. 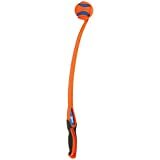 This is a unique dog ball thrower by nerf that’s features adustable distance and does not require throwing like the chuckit! How Far does it throw balls? 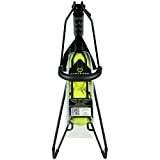 Ethical Pets 54299 Spot Launch & Fetch Tennis Ball Launcher Interactive Dog Toy, 24"
Launches up to 65 feet! This product is a normal launcher powered by pulling back the black spring loaded handle, then pulling the trigger when ready. How Far Does it Launch? What Size Ball Does it Take? Fetch made fun: you and your dog will love the thrill and fun of playing fetch with Franklin pet supplies dog fetch toy! Easily launch tennis balls without hurting your shoulder. Keeps dogs active: active play encourages your dog to exercise, and there's no better way to play than playing fetch. 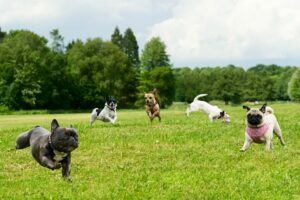 Dogs love to run and chase, and this activity is sure to keep them engaged at any age! 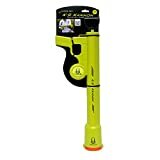 Durable and rugged: more than just a dog toy, this play fetch tennis ball launcher is durable and includes a comfort-grip handle for hours of enjoyment for you and your pet. Complete set: This play fetch toy includes the launcher and a Squeaky tennis ball. Keep your hands clean and avoid picking up slobbery, chewed-up tennis balls with this easy grabber and launcher. Comfort and control: prevent pain in your back and shoulders from bending down and picking up wet tennis balls. This tennis ball launcher is the perfect way to entertain your dog and grow closer together! This is a well rated dog ball launcher and is similar to the Chuckit! ball launchers. This thrower is comparable to the Chuckit! ball launchers and seems to be easier to pick up the balls. Foldable Thrower Extends to 29"
This is a unique dog ball thrower in that it’s foldable making it easier to pack or carry. The hinge does however add some extra play and the ball does not throw as precisely as the others but still does a pretty decent job. What Size Balls Does This Take? Standard 2.5 in Tennis Balls. There are many selections available for durable toys that last a long time for your dog. There are a few companies that make toys specifically for your dog. If your dog is large with powerful jaws you definitly should check out some of these indestructible dog toys. These toys will keep your dog playing and chewing for a long time before needing a replacement. Click Here for Embed Code for this Infographic on Your Blog!